Who Wants to Be a Lay Ecclesial Minister? A decade ago the United States Conference of Catholic Bishops (USCCB) released Co-Workers in the Vineyard of the Lord. This serves as a resource for bishops and others responsible for guiding the development of lay ecclesial ministry in the United States. Lay ecclesial ministers (LEMs) are those individuals who are adequately formed and prepared lay persons, authorized by the hierarchy to serve publicly in leadership for a particular area of ministry, in close mutual collaboration with clergy (...a population we’ve blogged about before 1, 2, 3, 4). There are approximately 39,600 LEMs in parish ministry in the United States today (up from 30,600 in 2005 and 21,570 in 1990). For practical purposes these are professional and trained lay persons involved in paid parish ministry for at least 20 hours a week. A recent CARA national survey of parish leaders estimated that 80% of LEMs in the United States are female and the median age is 55. Most self-identify as non-Hispanic white (88%). Only about one in 20 LEMs are of the Millennial Generation (born 1982 or later). As with many in the Church’s workforce there is interest in “the next generation.” What will the lay parish leaders of tomorrow be like? A lay ecclesial minister is someone with professional training working or volunteering in a ministry at least part-time for a Catholic parish or other Church organization (for example, director of religious education, pastoral associate, youth minister, campus chaplain, or hospital chaplain). Have you ever considered serving in the Church as a lay ecclesial minister? In this post we apply the same methods of analysis for those who have considered a LEM vocations that we used to determine the profiles of those who had considered becoming a priest, brother, or sister. First the issue of overlap must be addressed. Some may have considered more than one vocation in the Church. For LEMs this may be frequent as one might consider being a religious brother or sister that is primarily involved in parish ministry as a LEM. 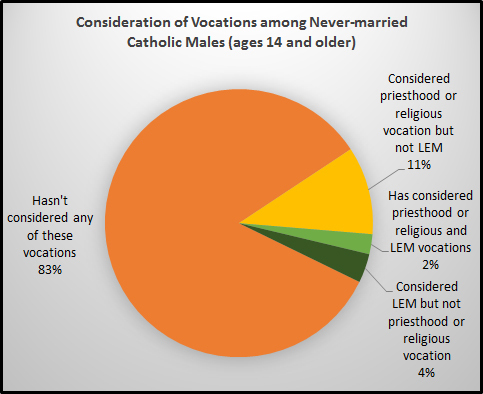 As shown in the figures below, 13% of never-married male Catholics have considered becoming a priest or religious brother and 6% have considered becoming a LEM. However, there is an overlap in these groups with 2% considering more than one of these vocations. Among those men considering a vocation it is more common to consider becoming a priest or brother without ever considering becoming a LEM. 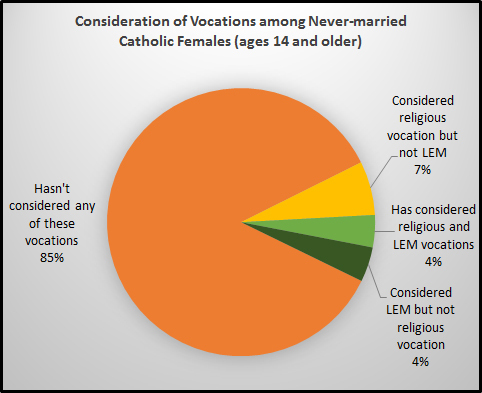 Among never-married females, 11% have considered becoming a religious sister or nun and 8% have considered becoming a LEM. Four percent have considered both of these vocations. Overall, 7% of respondents—male and female combined—said they had ever considered becoming a LEM. That is equivalent to more than 1.7 million never-married Catholics ages 14 and older. How is this sub-group of Catholics different from those who have not considered becoming a LEM? 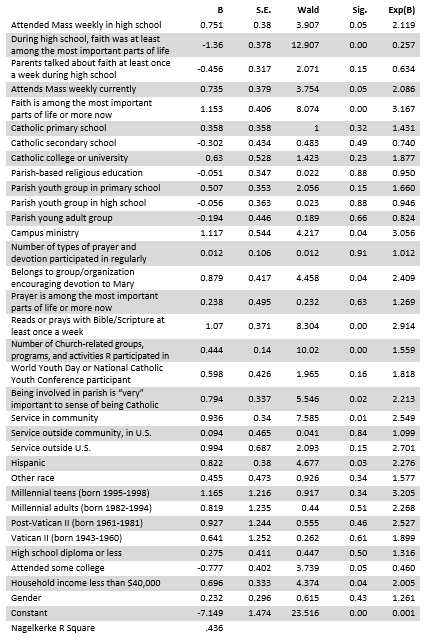 We used a similar logistic regression model to what was used to understand consideration of priestly and religious vocations in the 2012 study (excluding questions about encouragement as these were specific to those other vocations and questions about parish ministry or service that reflects some who may already be LEMs. A total of 0.9% of respondents indicated that they had considered becoming a LEM and now serve as such already). One key difference here is that the LEM model includes both males and females together with the addition of a variable for gender. This is important given that LEMs are disproportionately female. A total of 33 variables were included spanning information about one’s youth, practice of the faith, education, participation Church groups and activities as well as demographics (regression table). The factors listed below emerge as statistically significant positive predictors of having considered becoming a LEM. The impact of each, after controlling for everything else in the model, is reported as well. Gender is not a statistically significant predictor of considering a LEM vocation once one controls for everything else in the regression model. This means that the general observation that there are fewer male LEMs or fewer men interested in this vocation is attributable to gender disparities in the factors listed above—most likely the combined religiosity or importance of faith reflected in the statistically significant predictors. As noted previously, 88% of current LEMs self-identify as non-Hispanic white. Expect that to change significantly over the next decade and beyond. Much of the racial and ethnic diversity of the U.S. Catholic population is concentrated among those born after 1960. In CARA surveys of parish leaders, the average age at which LEMs say they hear the call to enter their ministry is 25. As more Millennial Generation Catholics, the oldest of which are 33 this year, enter ministry the diversity of LEMs will shift. This is already represented in the regression results noted above and in the diversity among those we know to be currently enrolled in LEM formation programs. According to CARA’s annual Ministry Formation Directory (MFD) surveys, 56% of those enrolled today in one of these programs self-identifies as something other than non-Hispanic white (47% Hispanic or Latino/a, 3% Asian or Pacific Islander, 3% African American or black and 3% something else). 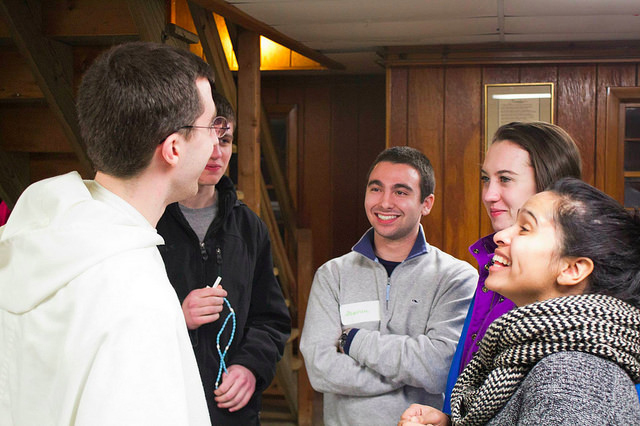 What is also clear is that a great place to find the LEMs of tomorrow may be in the Catholic campus ministry programs at the public, private, and Catholic colleges of today. This is quite different than the profile of interest in other vocations. The best education-related predictor of women’s considering a religious vocation was enrollment in Catholic primary school and the best similar predictor for men’s interest in becoming a priest or brother was enrollment in a Catholic secondary school. 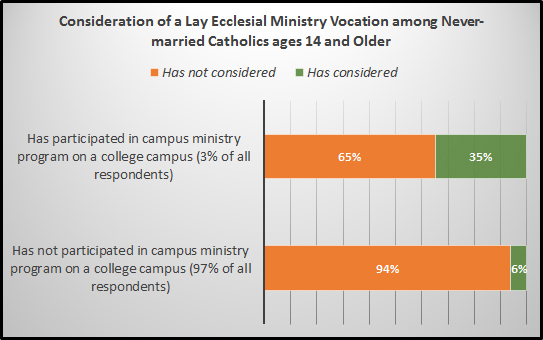 As shown in the figure below, more than a third of those who participate in campus ministry programs consider a LEM vocation (35%). CARA’s results are almost identical to results of a survey of university students known to campus ministries in Dean Hoge and Marti Jewel’s 2007 book The Next Generation of Pastoral Leaders. Among the campus ministry respondents, those who are leaders or officers in their organization were most likely to have considered a LEM vocation (52%). Campus ministry image courtesy of St. Joseph Province of the Dominican Friars.